Remember the slap bracelets in the 90s. They were all the trend for a few years. Then came the rubber “charity/message” bracelets in the 2000s. 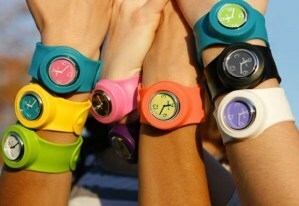 Now Big Time Brands, has blended both concept and created Slap Watch and they’re not just for kids anymore. Slap Watch is a unique twist on the silicone watch craze, incorporating the addictive mechanism of the spring coil bracelet of the 90’s. The Slap Watch is available in 15 eye popping colors with interchangeable faces – creating endless fun and stylish possibilities. First you pick your “face” style – the actual watch piece. The created different looks by buying packages with different bands for each watch face. You can create enough different looks to last you, 435 DAYS and never wear the same style twice!